There is a great dearth of books on the history of All India Muslim League which was established at Dhaka in 1906. In December 1947 it was decided to bifurcate it into two organizations–––one for India titled “Indian Union Muslim League” and the other for Pakistan as “Pakistan Muslim League”. There is no doubt that a number of books/works have been published on the Muslim League but these are piecemeal studies, a comprehensive work is still being awaited. The NIHCR is working on a number of projects in this connection, but to fulfill the need of the hour a chronology encompassing all important events regarding the functions of AIML and the Pakistan Movement, was planned by the author two years ago. By the Grace of God the work has been completed including all the important events such as party meetings including those of its General Sessions, meetings of the Council, Working Committee and the Committee of Action. By going through the pages of this book the reader is expected to go through the history of All-India Muslim League being a party which not only worked for the preservation and promotion of Muslim rights, but helped in organizing the Muslims of South Asia into a well disciplined and well-organized Muslim Nation which was able to achieve its goal of Pakistan as the largest Muslim State in the world within the shortest possible time of its history under the dynamic leadership of Quaid-i-Azam Mohammad Ali Jinnah. The book will also reveal how democratic was the Quaid who consulted his party on each and every matter of national importance making the party as the most authoritative representative organization of the Muslims of South Asia. Prof. Dr. Riaz Ahmad has in his credit a teaching/research experience of 35 years in the field of History and Pakistan Studies, in Pakistan as well as abroad. Presently, he is the Director of National Institute of Historical and Cultural Research, Centre of Excellence, Quaid-i-Azam University, Islamabad. Simultaneously, he is the Professor, Quaid-i-Azam Chair, NIPS, Quaid-i-Azam University. He has been awarded Tamgha-i-Imtiaz in recognition to his valuable contribution in teaching as well as research. Quaid-i-Azam has been his main field of teaching and research. He has also written books on the history and constitutional development of Pakistan. Another field of his research is mysticism. Before the present position Prof. Dr. Riaz Ahmad taught different subjects of History in the Department of History, Quaid-i-Azam University, Islamabad. He also taught at Mohammad V University, Rabat, Morocco during 1992-1993. 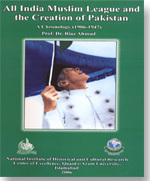 He presented research papers at various national and international conferences in Pakistan and ten countries abroad. Among his scholarly works, 17 books are on various aspects of Quaid’s life and times, which make him an eminent scholar of Quaid-i-Azam Studies. Thus he has attained international recognition as a specialist on the life and times of the Quaid. Among other fields, he has contributed valuable books on the life and times of Mohtarma Fatima Jinnah. As a prolific writer, he has also undertaken some important projects like the present one on the All-India Muslim League which make him an authority on the Pakistan Movement.